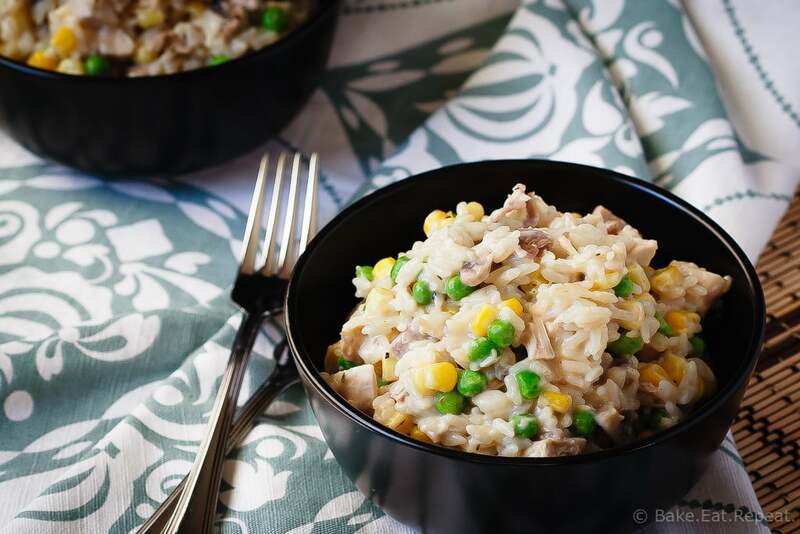 This 30 minute creamy one pot turkey and rice is filled with flavour and a fantastic way to use up your leftover turkey! Fast, easy, delicious. Do you sometimes get sick of leftovers before you’ve managed to use up all that leftover turkey after a holiday meal? I’ll freely admit that I don’t, really. I could easily just have turkey dinner every night until the leftovers are gone. That’s probably just laziness on my part though – heating up some leftovers is infinitely easier then cooking a meal, even when you love to cook. When you make a giant turkey, as I invariably do (I figure if I’m going to make a turkey, I might as well buy the biggest one I can find! ), there’s usually enough leftovers to last for more meals then you really want to eat. So I love to find different ways of using up those turkey leftovers. This creamy one pot turkey and rice is a perfect way to use them up. It’s also great with chicken, so it’s become the meal that I think of whenever I have some cooked chicken or turkey sitting in the fridge begging to be used in a quick and easy meal. 30 minutes. One pot. With ingredients that you likely have already. That’s a winning combination in my books. Plus the whole family will love it! I’ve made this no less then 5 times in the last month, trying to get the recipe perfect, and my family is still happy when they hear that this is for supper. They eat it happily and take the leftovers for lunch. It’s perfect. 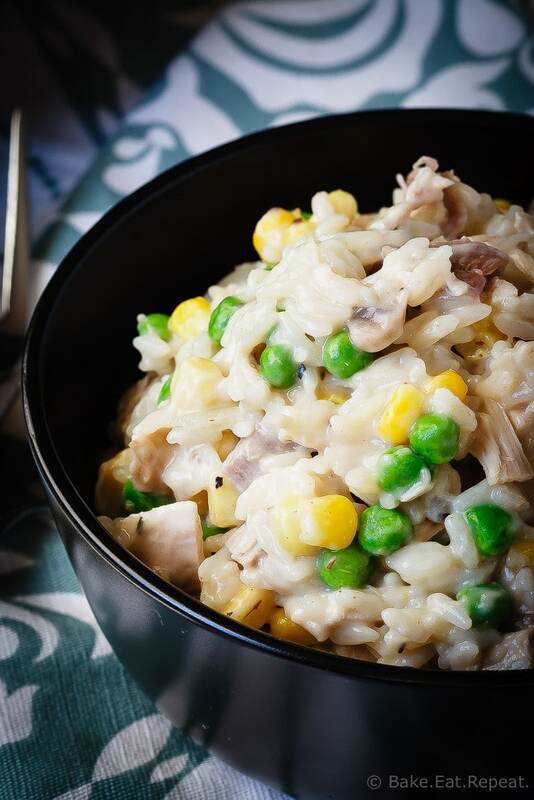 So this creamy one pot turkey and rice was the perfect choice for this month’s 30 Minute Thursday. If you’re new around here, on the first Thursday of the month myself and some of my blogging friends each share a recipe that can be made in 30 minutes or less. I love these lists as it’s a great place to look for meal time inspiration when I realize at 5pm that I don’t know what to make for supper. I mean, I never do that. That’s crazy. I totally menu plan. Or, um, I should. But, until I manage that, it’s a good thing I’ve got these 30 Minute Thursday lists to get me through the week without resorting to sandwiches half the time! The links are below the recipe so be sure to check them out! In a large skillet with a lid, melt the butter over medium heat. Add the onion, garlic and mushrooms and cook, stirring for 2-3 minutes or until the onion is softened. Add the flour, salt, pepper, thyme and paprika and continue to cook, stirring, for 1 minute. Slowly stir in the milk and chicken broth. Add the turkey and the rice and bring to a boil over medium heat. Stir, reduce the heat to low, and cover with a lid. Simmer for 15-20 minutes or until the rice is tender. Stir in the corn and peas and heat through. For this recipe I used long grain white rice. If you’re using a different type of rice, you may need to adjust the amount of liquid or the cooking time. For the rice I use, I needed 2 cups of liquid for 1 cup of rice and 20 minutes of cooking time. If the rice you are using is different (according to the package directions), adjust the amount of chicken broth and cooking time accordingly. This was easy & delicious , thank you! Can you use ground turkey for this recipe too? Yes, it's great with ground turkey, just brown it first and then continue with the recipe. Leftovers are king in my house! We only made a small amount of turkey for Thanksgiving because it was just the two of us, but we definitely have leftover chicken a bunch throughout the year. What a perfect idea to repurpose!! I definitely get sick of turkey after day 2 or 3. This looks like a great way to extend them...creamy and delicious! I live for leftovers. I don't mind eating the same thing many nights in a row. But it's also great to re-purpose them, like you've done here. This dish looks so creamy and dreamy! Yum! I love finding new ways to use leftover turkey! Like you, I could just eat it as it, but it's more fun to switch it up. 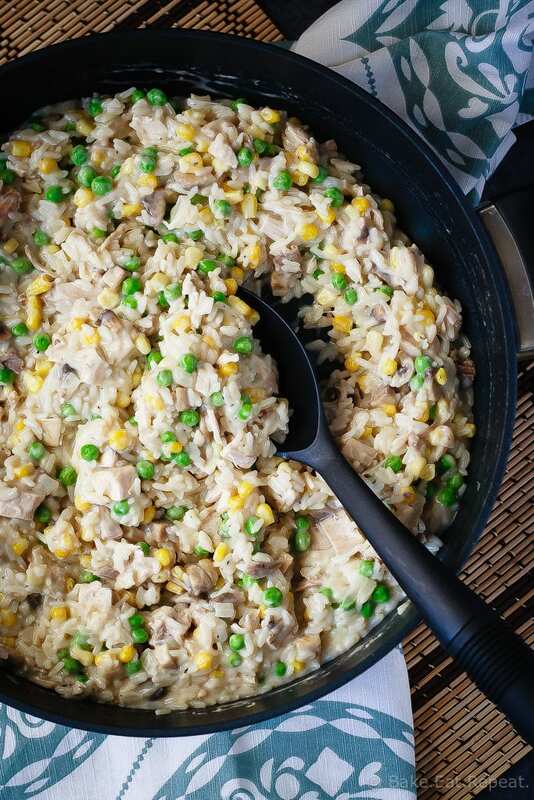 This turkey rice recipe looks SO good, Stacey! I love how simple, yet flavorful this is. Definitely trying this out!